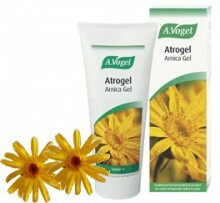 Atrogel® is a herbal remedy made from extracts of fresh Arnica flowers and is an easy-to-apply non-greasy gel. It is ideal if you are looking for a treatment to relieve pain in conditions such as muscle aches or pains, stiffness or after sporting injuries. It can be used up to4 times a day. Click the button below to add the A Vogel Atrogel Arnica Gel 100ml to your wish list.